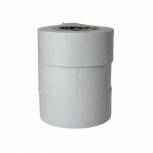 Q-Connect Double Sided Tape 25mm x 33m (Pack of 6) KF02221 Pack of 6 Q-Connect Double Sided Tape. Tough vinyl tape with double sided adhesive. Size - 25mm x 33m. 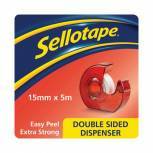 Sellotape Double Sided Tape and Dispenser 15mm x 5m 1445290 Pack of 1 Sellotape dispenser with double sided tape. Versatile tape creates an instant dry adhesive bond. Ideal for displays, mounting and exhibition work. Size: 15mm x 5m. 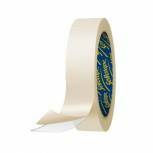 Sellotape Double Sided Tape 50mm x 33m (Pack of 3) 1447054 Pack of 3 Versatile tape coated with strong adhesive on both sides to create an instant dry adhesive bond. Easy tear and easily removable backing paper for effortless use. 50mmx33m. Pack of 3 rolls. 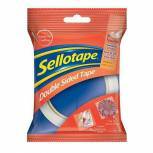 Sellotape Double Sided Tape 15mm x 5m (Pack of 12) 1445293 Pack of 12 Versatile tape coated with strong adhesive on both sides to create an instant dry adhesive bond. Easy tear and easily removable backing paper for effortless use. 15mmx5m. Pack of 12 rolls. 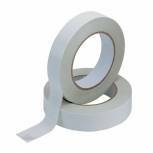 Sellotape Double Sided Tape 12mm x 33m (Pack of 12) 1447057 Pack of 12 Versatile tape coated with strong adhesive on both sides to create an instant dry adhesive bond. Easy tear and easily removable backing paper for effortless use. 12mmx33m. Pack of 12 rolls. 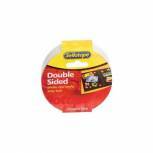 Sellotape Double Sided Tape 25mm x 33m (Pack of 6) 1447052 Pack of 6 Versatile tape coated with strong adhesive on both sides to create an instant dry adhesive bond. Easy tear and easily removable backing paper for effortless use. 25mmx33m. Pack of 6 rolls. 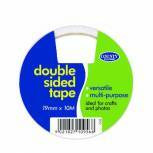 County Double-Sided Tape (Pack of 12) C422 Pack of 1 County Double Sided Tape. Ideal for arts and crafts. Size: 19mm x 10m.